I will be one of the two featured artists at the show this year. There will be vendors, a food court, and auctions as well as a boutique. I will be there selling my book also, Fabulous Tee Shirt Quilts. The show price is $20. This is the 2007 Best of Show quilt by Lynette Reynolds. For the last show, the food was delish! The quilts were beautiful and there were so many! Eye candy! I bought a small quilt at auction. I am looking forward to a great event! I’ll be doing a presentation about dating quilts at the Purdue University Extension Sewing Expo in Noblesville, Indiana, on Saturday, October 10th, at the Hamilton County Exhibition Center in the Hamilton County Fairgrounds, 2003 Pleasant Street. Capi Saxton of Always in Stitches and several others. 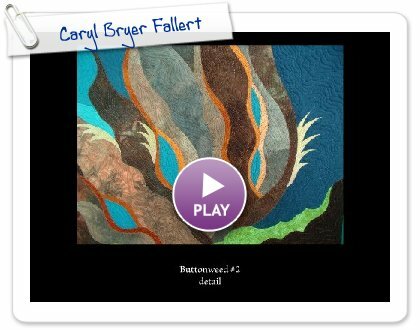 This Smilebox slide presentation of Caryl Bryer Fallert’s quilts is from The Quilt Show. Caryl’s quilts are breathtaking! I will be appraising quilts at the Heritage Quilters of Crown Point’s “Indiana Rose XII Quilt Show,” in Crown Point, Indiana, on Saturday, October 3, 2009. I am a quilt appraiser certified by the American Quilter’s Society. The show is October 3 – 4, 2009, at the Timothy Ball School, 720 W. Summit St., Crown Point, IN. There will be 250+ quilts displayed; quilt appraisals, merchant mall, food vendor, raffle quilt, boutique, silent auction, special challenge display, and door prizes. SAQA’s 2009 Benefit Auction begins September 10th. This is an online auction of 235 pieces. Go to the website to see the fabulous work that will be auctioned. I can’t wait! I plan to bid on several pieces…..hope I get one! 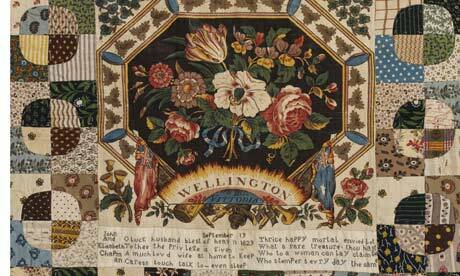 Detail of an 1829 quilt by Elizabeth Chapman. Click on the image to enlarge it. See the August 19th posting. 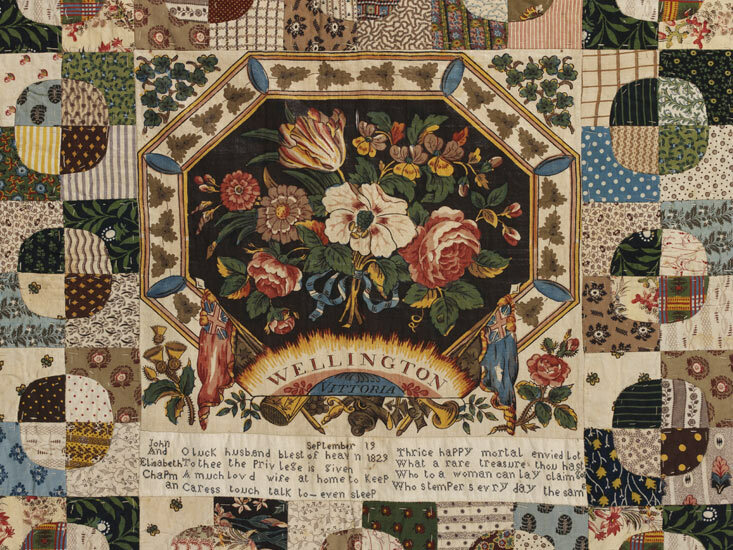 Some of the worldʼs best known quilts — Jonathanʼs Holsteinʼs Amish quilts shown at the Whitney in 1971 — are on display at The Textile Museum in Washington, DC. through September 6th. Hurry up and see the exhibit if you can! Twenty-six large quilts and 3 crib quilts are on loan from the International Quilt Study Centerʼs donated collections of Robert and Ardis James, Henry and Jill Barber, and Holstein. Quilters have the biggest hearts in the world. American quilters now have a unheard-of opportunity to do a good deed that will help our country’s image, aid our troops stationed in Iraq, and help Iraqi women who are bearing the brunt of so much destruction in their country. This is not a political project—it is a project started by one quilter’s husband who is now stationed in Iraq. I have looked into it personally and think it is a marvelous effort to make a difference—I feel certain that many quilters will want to help this happen! First, go to your stash and see what you can spare—fabrics, scissors, thread, thimbles, notions like needles and pins, etc. No books—too heavy. If you’re also a knitter, yarn and needles would be great to include. Lots of us have duplicates, even triplicates, and what a great way to lighten your stash, gain storage space, and do good, all at the same time! Then go to the post office and get one of their large, flat-rate FFO/APO boxes, which are fairly sizable (one quilter sent 9 pounds in one box). At just $11.95 to mail, it’s a great tool to use in this project. Package your donations according to Major LaFlamme’s directions (this is very important as it will reduce the help needed to unpack and distribute these supplies) and mail it to him in Iraq at his special project address (the post office will ask you to fill out a customs form, too). Here, in his own words, is Major LaFlamme’s description of how the IBOLs will be distributed: “Some would be delivered by US forces, to local individuals and to local groups and small businesses who have had micro grants or loans from either the US or the Iraqi government. I see this as reinforcing good with more good. Some would also go out with US forces, to places like rural villages, camps for displaced persons, orphanages (which often means single moms who are without tribal men to provide for them), and the like. And some would go to our partners in the Iraqi security forces or police. All you have to do is get a flat-rate APO box from the post office, fill it with extras from your stash, package it according to his directions, and mail it for $11.95. I think it would be a lovely gesture to include a photo, your first name, and your state, so that the lucky recipient knows this came from a real person in a real state in a real country with a really big heart. You could send a letter, too, but remember that English is not widely known. But anyone can understand a photo, a name, and a state. Timing is essential. Major LaFlamme wants these gifts from the heart to be delivered during Ramadan, and that means we have to move fast to get them overseas in time for him to deliver them. He needs to receive them no later than September 17; allowing about 10 days transit time, that means boxes need to be postmarked by September 7. So don’t put this off till later…DO IT NOW! Join with the rest of the quilters in The Festival Brigade and let’s make this project happen! The address for this is below. You won’t find it on the Bundles of Love website, but I’m sharing it with you here in this e-mail. Major La Flamme is keeping it off of the web, since this project is set to come to an end with Ramadan in mid to late September. Feel free to share it with others, but please help us respect his request—both for safeguarding this address, and for getting these bundles into the mail by September 7. I know how much receiving a Bundle of Love would mean to me if I were living in the conditions the Iraqi women endure, and I urge you to take action IMMEDIATELY to participate in this fine project. What an impact this can make. * The extra stash was paid for long ago. * The postage will run $11.95 if you use the APO flat-rate box. * The box is free. * The goodwill is priceless. Center, Cates Avenue, at North Carolina State University in Raleigh, NC.